Image size is 13" x 18", printed on heavy paper with substantial border on all four sides. Dalmatians are known as "Carriage Dogs" because of their once popular use as guards of carriages, beneath the axles of which they ran. Americans know them as "Fire Dogs" from their similar use with horse-drawn fire engines. 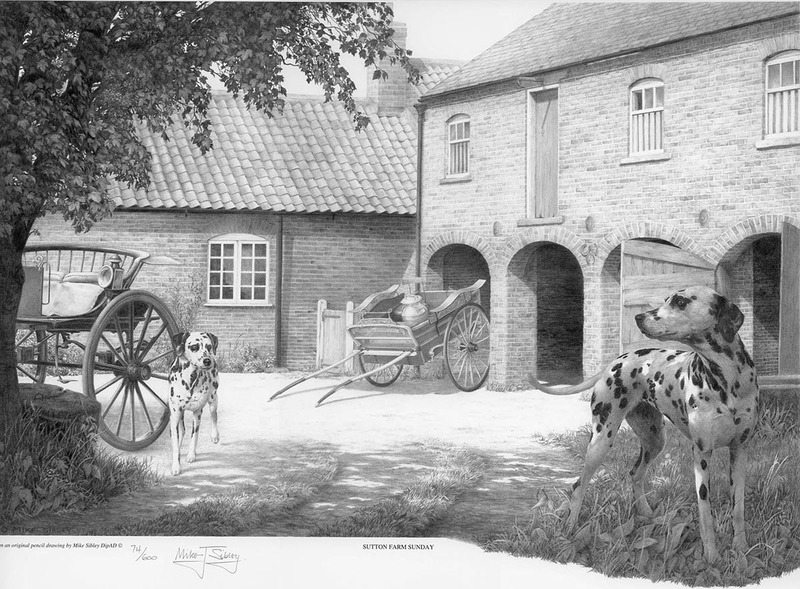 Here the dogs are associated with the carts and carriages of Sutton Farm. It's Sunday — the milk delivery cart is not in use today but the stick-back gig is ready for the journey to church. The farm is that of our neighbour and the setting is very much as you see it - although the top floor of the coach house has since been converted to living accommodation. The cart and carriage were seen at one of our local agricultural shows. The original drawing took 161 hours to complete and remains in my private collection.